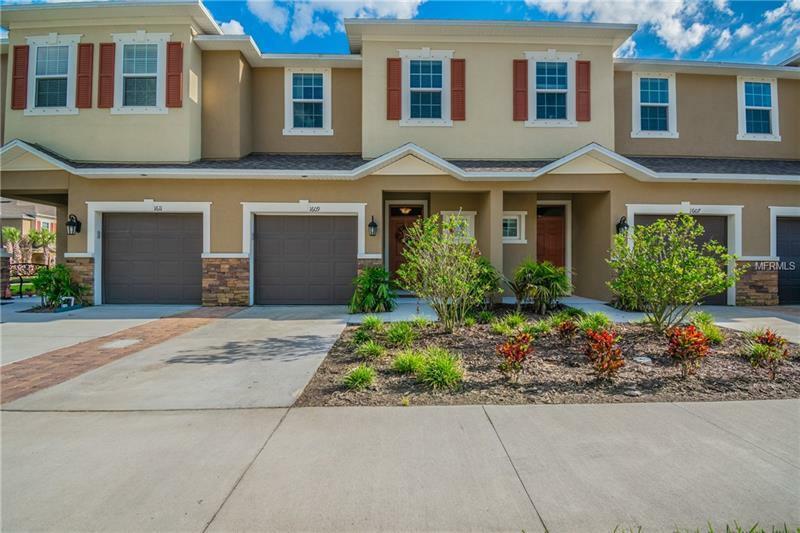 Impressive 1525 sq ft, 3 bedroom, 2.5 bath, 1 car garage town home in desirable community of Tuscany Woods in Oldsmar, built in 2017. Enter the home to the family/dining room combo w/views through the sliders to screened-in porch and pond. The kitchen offers a nice design with lots of cabinets and stainless steel appliances. Kitchen features granite countertops with plenty of space for cooking, subway tile backsplash and bright window. Enjoy the tranquil views of the outside from your kitchen sink. Tile through out the main floor and newer carpet in the bedrooms.The dining room/family room is right off the kitchen and creates a nice flow that is ideal for entertaining. The second floor master bedroom suite features bath with dual sinks, granite counter tops and large glass shower. The second and third bedroom and full bath are located just down the hallway along with the washer and dryer. This pet-friendly, gated, maintenance free town home community is across the street to Cypress Forest Recreation Center with multipurpose gym, spray park & trails and located near to restaurants, shopping, downtown Oldsmar and Tampa, parks, beaches and Tampa International Airport.